So the best and worst thing about living in Arizona is that spring/summer comes EARLY…. meaning that there is little time between Christmas and when you get the chance to tan lol. Growing up I always tanned pretty easily, and throughout high school I even did the tanning bed phase (so bad, I know). But in college I really got hooked on spray tans! I would get one the night before a social or big event and would wake up the next morning to shower it off and get ready. It was such a lifesaver at the time, but now I’m looking for a more long-term and more affordable way to stay tan without ruining my skin! 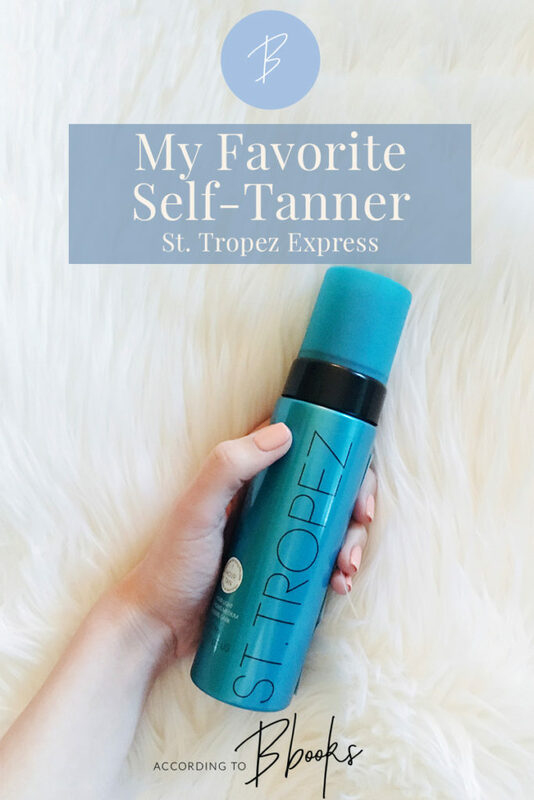 My senior year I bought my first bottle of St. Tropez Express at Ulta and it is a game-changer!! It’s amazinggggg because the St. Tropez Express tanner only takes 3 hours to fully develop before you wash it off. Most spray tans you get at a salon have to sit for 8 hours! With the Express tanner you can even wait as little as one hour – it just depends on what shade you want! 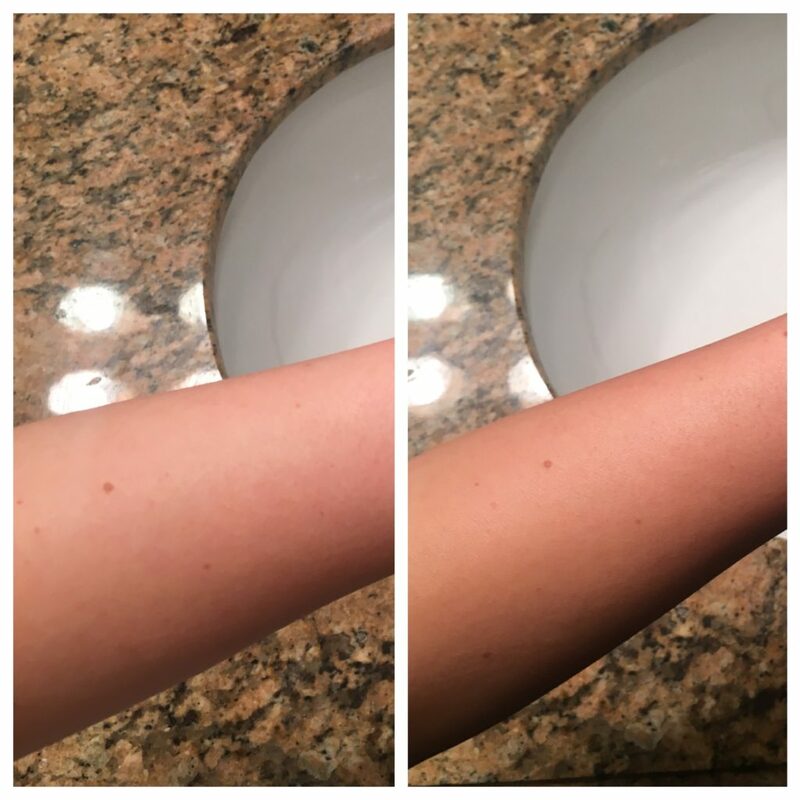 Left: my arm before applying the tanner. Right: My arm after applying the tanner and waiting 2 hours for it to build. DRY BRUSH and then hop in the shower first! This sounds like a waste, but I just hop in the shower really quick to open my pores, exfoliate (important!!! ), and shave. It really helps your skin to absorb the color! Put your favorite lotion lightly on your heels, back of hands, knees, nose, etc! This will prevent these areas from getting too orange. After you’re completely dry, start by pumping 2 pumps worth of the St. Tropez Express mousse onto the mitt. If yours didn’t come with a mitt, you can buy one here! I usually start with my lower legs then slowly work my way up. Continue pumping 2 pumps of product onto the mitt as needed. I actually will apply two coats to my chest so that it gets a little bit darker! Without putting more product on the mitt, I use the ‘residue’ on the mitt to cover my face, the back of my hands, and the tops of my feet. The self-tanner shows most in areas that have the most dry skin, and these are the areas that you’ll want to be careful! Wait 60 seconds before putting clothes on. I usually just wear an old cotton black dress I don’t care too much about in case of any staining. Wait 1-3 hours depending on how dark you want to get and shower off when you’re ready. I usually don’t exfoliate for a couple of days after I use self-tanner to make the color last as long as possible. That’s it! It’s so simple and gives the best color too. I definitely feel tanner for a good 4-5 days after using it too! You can shop the St. Tropez product I use (and more) in the widget below! What do you guys use for self-tanner? Any out there I have to try?! I’ve been wanted to get my hands on one that’s all natural — leave your comments and recommendations below! Great review! Personally, I have tried this one out and I actually didn’t love it. I didn’t really like the way it felt on my skin and for me it wasn’t dark enough of a tan. If you’re interested in reading some reviews on other brands check out my blog! Hi Emily! Thanks for checking out my blog – I have never met anyone who wasn’t a fan of it! Interesting to see a new perspective. Your blog is beautiful!